Disney's Beach Club Resort is a beach-themed resort which is part of the Walt Disney World Resort in Lake Buena Vista, Florida. 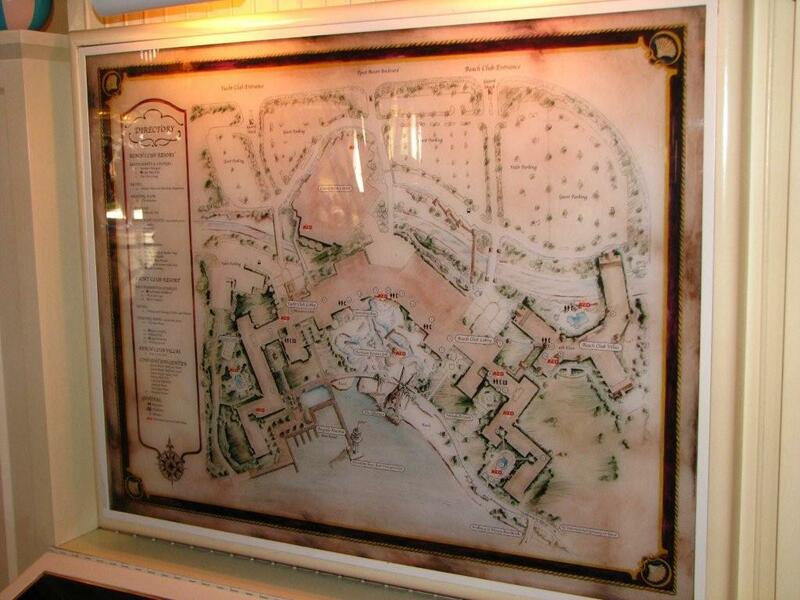 The Beach Club Resort is one of the Epcot Area Resorts. It is located on the lagoon which lies between Epcot and Disney-MGM Studios and is close enough to walk to either Epcot's International Gateway park entrance or Disney-MGM Studios. Boat transportation also runs to Epcot and Disney-MGM Studios as well as the Boardwalk and the Swan & Dolphin. The resort shares amenities with Disney's Yacht Club Resort and also has villas that are part of Disney Vacation Club (DVC). Located at the Beach Club is the popular Cape May Cafe which holds an indoor clambake for dinner and a character breakfast currently with Minnie Mouse, Goofy, and Chip n' Dale. Beaches & Cream Soda Shop is a small snack shop located here as well. The Beach Club, and the Yacht Club, were featured on the Travel Channel show "Great Hotels." 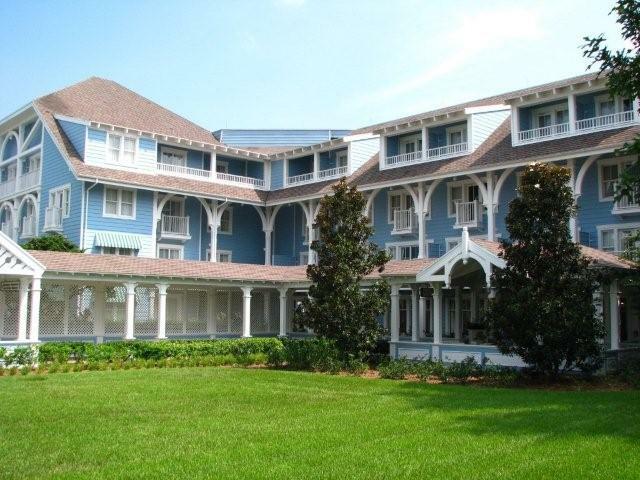 The rooms at the Beach Club are themed after those found in some New England Inns by the sea in the 1930s. There are both standard rooms (two queen-size beds or one king-size bed) and suites. Every room contains a spacious bathroom with two sinks, a shower and toiletry items. For the highest level of luxury the resort also offers a 5th floor Concierge Level with private floor access, a full-service concierge lounge, deluxe turn-down service, and many additional amenities. The Concierge Level is also home to the resort's Presidential Suite. Yachtsman Steakhouse A signature dining restaurant famous for its fine selection of steakhouse dishes and a formal but enjoyable nautical theme in a ship-shaped restaurant layout. The restaurant features an open kitchen with a display of tasty high-quality aged beef cooked on an oak-fired grill. The restaurant serves dinner only and reservations are strongly recommended. This restaurant is located at the Yacht Club Resort. Cape May Cafe A casual and character dining restaurant famous for its Character Breakfast buffet and New England seafood dishes. The restaurant features a festive "clambake celebration" theming, a relaxing waterfront view, and hosts a popular Character Breakfast with Goofy and other famous Disney characters. Reservations are strongly recommended for the Character Breakfast. This restaurant is located at the Beach Club Resort. Yacht Club Galley A casual dining restaurant with a tasty American breakfast buffet and A la Carte menu selection for lunch and dinner. The restaurant features similar nautical theming to that of the Yachtsman Steakhouse but in a much more casual atmosphere. This restaurant is located at the Yacht Club Resort. 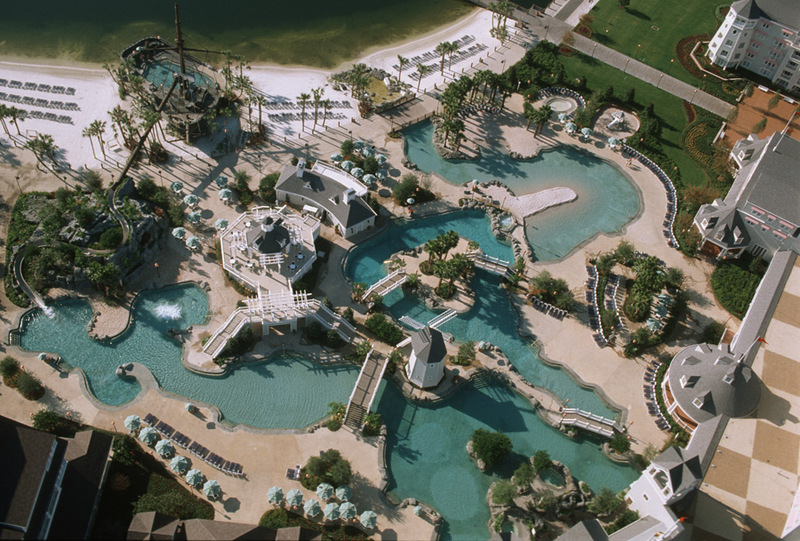 Stormalong Bay is the resort's main pool complex that resembles a beach-side water park with its sand-bottom pools, a circular lazy river, waterfall, and the "Shipwreck"; a large replica of a ship wreck with one of the highest hotel water slides at Walt Disney World. The Stormalong Bay pool complex also offers a poolside counter-service restaurant and bar, a shallow kiddy area, and an elevated tanning deck. Stormalong Bay is centrally located between both resorts facing Crescent Lake. Quiet Pools The resorts offer 3 quiet pools for guests who prefer a smaller and less active pool experience. The Yacht Club Quiet Pool is located on the far end of the resort in a quiet garden area and The Beach Club Quiet Pool and jacuzzi is located on the opposite far end of the resort facing Crescent Lake in a similar garden area. A third pool is privately located in the Beach Club Villas building facing a smaller lake which can also be used by all resort guests but is exclusively located for guests staying in the Beach Club Villas. Ship Shape Health Club A fully-equipped health and fitness center free of charge for resort guests. The health club is centrally located between both resorts and offers quality fitness equipment, steam room, sauna, and spa. The center also offers massage therapy by appointment only. Lafferty Place Arcade An exciting indoor arcade located near the Beaches & Cream Soda Shop. Bayside Marina The resort's lakeside marina offers a variety of watercraft available for rental including private cruises and fishing excursions. Sandy Beach The resorts offer a beautiful lake-side white sand beach on Crescent Lake. A perfect place to enjoy the sunset and take in the view of the illuminated Boardwalk just across the lake. Tennis & Volleyball The resorts also offer tennis courts on the Yacht Club Resort side and a sandy lakeside volleyball court available for resort guests on the Beach Club Resort side including complimentary equipment offered at the Stormalong Bay Towel Window. 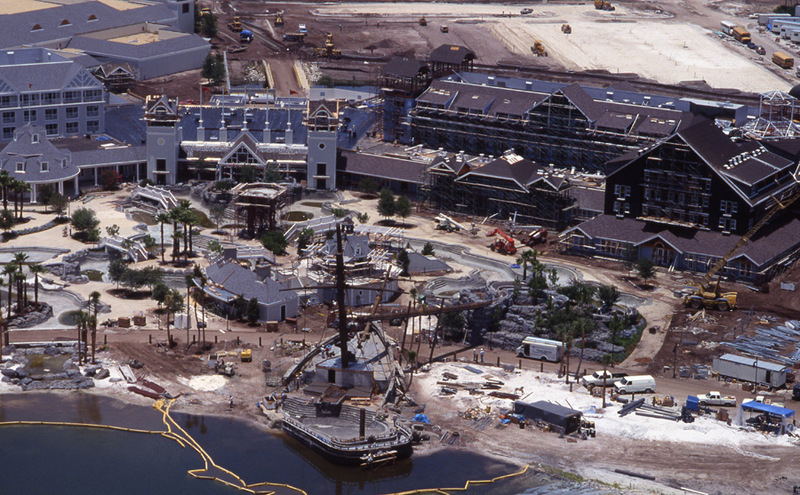 The Disney's Yacht & Beach Club Convention Center features over 73,000 square feet of flexible state-of-the-art meeting space including two large ballrooms and 21 breakout rooms. In additions to business meetings and conventions, the elegant ballrooms also host many social functions including Disney Wedding receptions. Similar to other resort facilities, the Convention Center is also shared by both resorts and is centrally located between both resorts. A special feature for guests staying at Disney's Yacht & Beach Club Resorts is an exclusive entrance to Epcot's World Showcase known as the International Gateway. The special entrance is within walking distance or via a short "Friendship" water taxi ride and offers a full service park entry gate, park exit, ticket windows, locker rentals, wheelchair/stroller rentals, and a gift shop. The International Gateway and canal is located between the United Kingdom and France pavilions. Information from Wikipedia. Best place to find stuff on the web!